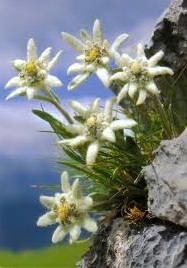 Edelweiss (Leontopodium alpinum) is a well-known European mountain flower and named as the national flower of Austria. Came from the Sunflower family, the Edelweiss has leaves and flowers that covered with white hairs and appear looks like wool. It's flowering stalks can grow to a size of 3–40 cm. 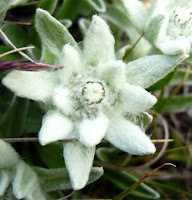 Each Edelweiss' bloom consisting of five to six small yellow flower heads (5 mm) surrounded by bracts in star formation. The Edelweiss flowers are in bloom from July to September and this small beautiful white flower is only blooms in a short period of time. Edelweiss prefer to growth in rocky limestone places at 2000–2900 m altitude, but with an extra care it also can be grown in the garden (in cool temperature). The dense hair appears to be an adaptation to high altitudes, protecting the plant from cold, aridity and ultraviolet radiation. Edelweiss has been used traditionally in folk medicine as a remedy against abdominal and respiratory diseases.